The University of Southampton has forged a new strategic partnership for public engagement with the Winchester Science Centre and Planetarium, inspired by a shared vision to change the world for the better by revolutionising public engagement for the enhancement of knowledge and understanding of science. 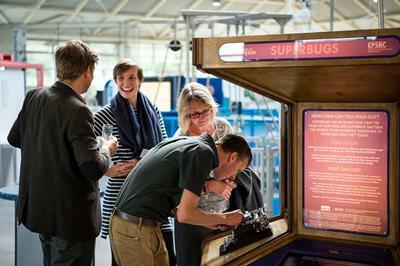 The partnership, launched at a special event held in Winchester, is the start of a formal alliance to bring the University’s latest world-leading research into the hearts and minds of visitors to the Science Centre. Professor Sir Christopher Snowden, President and Vice Chancellor of the University of Southampton said: “It was my great pleasure to join with our colleagues from Winchester Science Centre and Planetarium to launch this new strategic partnership which represents a shared vision with the University of Southampton to use public engagement in science as a catalyst for activities that will lead us all to changing the world for the better. Ben Ward, CEO of Winchester Science Centre and Planetarium added: “Scientific public engagement has the potential to transform lives. It educates, empowers and inspires generations and encourages debate about topical issues that affect us all.